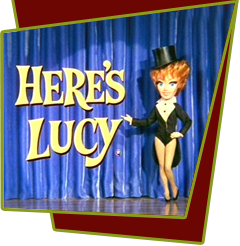 Harry rents out Lucy's house to a production company making a movie with Chuck Conners. After being a pest with the movie star, she is banished until the filming is completed. When she thinks all is clear, Lucy goes home, not knowing that Chuck Connors is sleeping in her bed. When she finds the stranger, and then a scared Lucy knocks out the big star. Bloopers: When Chuck Connors is filming in Lucy's living room a crew member sits on a step ladder stenciled LBP, Lucille Ball Productions.